I love seals. It makes everything official. So, I was happy to have received my second seal since I’ve written Piazza Navona. 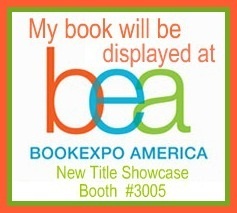 The first one is here and now another from Book Expo America 2014, confirming that a hardcopy of my book will be on display in New York for the Book Expo America -held over Memorial Day Weekend. I am very excited and proud and I hope, those of you able to attend the event, will take a few minutes from your day to thumb through the pages and consider buying the book; also emailing me to say how much you loved it. :).